I keep reading articles exhorting me to move meat to the status of a relish and to make vegetables the star of my meals. That’s not a bad solution for people who don’t want to give up meat altogether but are cognisant of the arguments against its production and consumption. While it’s unlikely I’ll ever become a vegetarian (bacon! ), let alone a vegan (cheese! ), I do try to keep a healthy balance. Sometimes the meat or fish element will be just a handful of bacon lardons or anchovies to add depth and flavour. Sometimes our meals are entirely vegetarian and we grow quite a lot of what we eat. I’ve never tried cultivating mushrooms although I do remember my sister keeping a fungus-impregnated log under the stairs many years ago. As I recall, she didn’t get much of a crop. 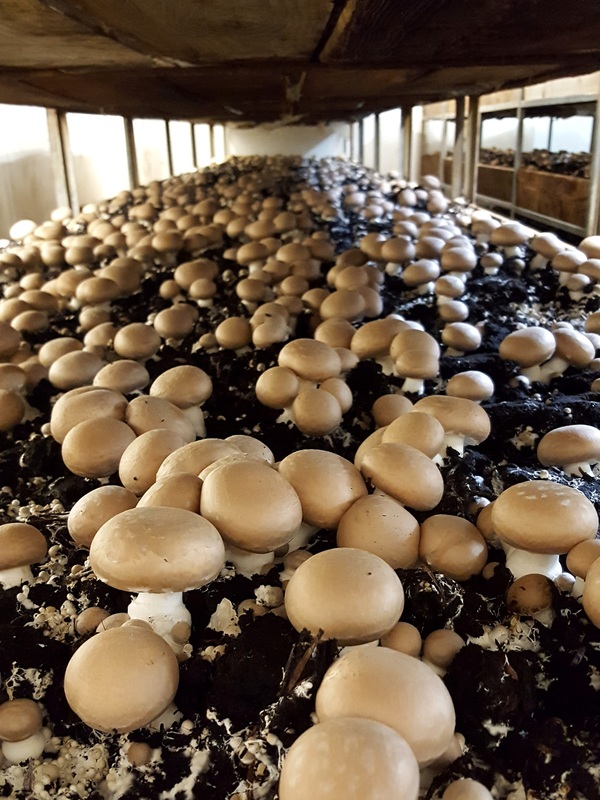 We’re fortunate though in having a number of mushroom farms in Suffolk. I interviewed Patrick Hearne, boss of organic growers Capel Mushrooms, for a magazine article recently. He was telling me rather wistfully he remembered when mushrooms were a luxury item, but today they’re cheap enough that most of us chuck them in our supermarket trolleys without a second thought. 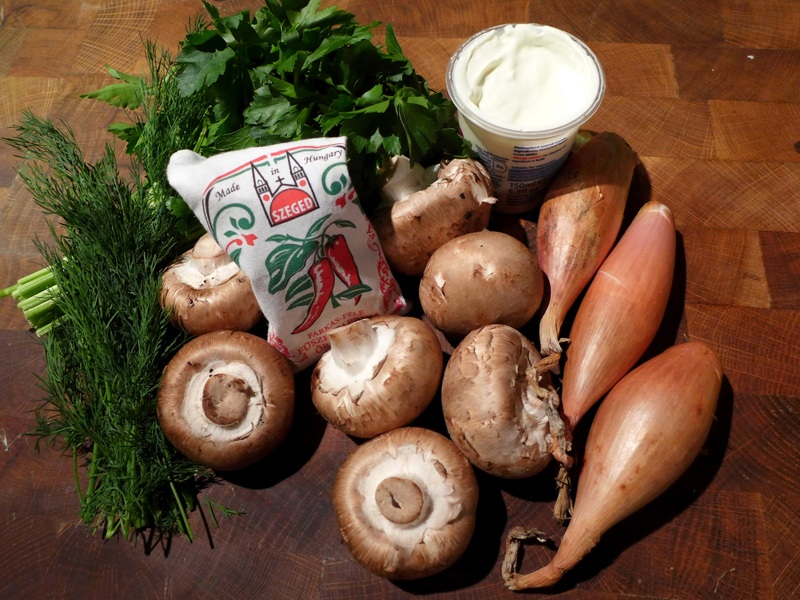 I love mushrooms and this recipe makes a fast, tasty and economical weekday supper. It’s equally good over rice, tagliatelle or just buttery mashed potatoes. PS Apologies to anyone who is wondering about The Case Of The Vanishing Pavlova … the post was published in error today and will re-appear shortly. Melt the butter with the oil in a deep frying pan and cook the shallots gently until soft and golden. Add the garlic and cook for a minute more. 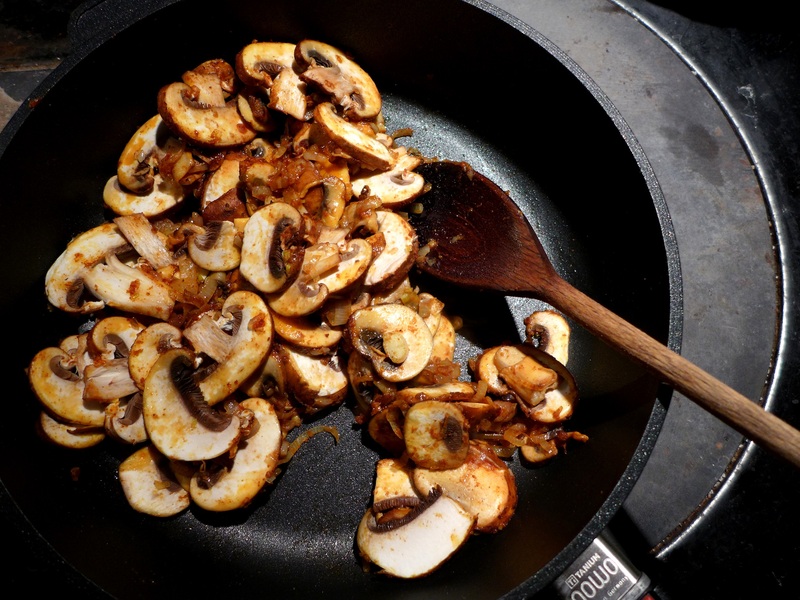 Put the mushrooms in the pan, increase the heat to medium and fry for five minutes, until they’ve given up some of their moisture. Stir in the paprika and caraway seeds and cook for a minute or two more. Pour in the stock and cook until most of the liquid has evaporated, then add the sour cream. Allow the mixture to thicken if necessary and season with salt and pepper. Add a squeeze of lemon juice if it needs sharpening. Stir through the herbs, saving a few to garnish. A salad on the side and you’re good to go. 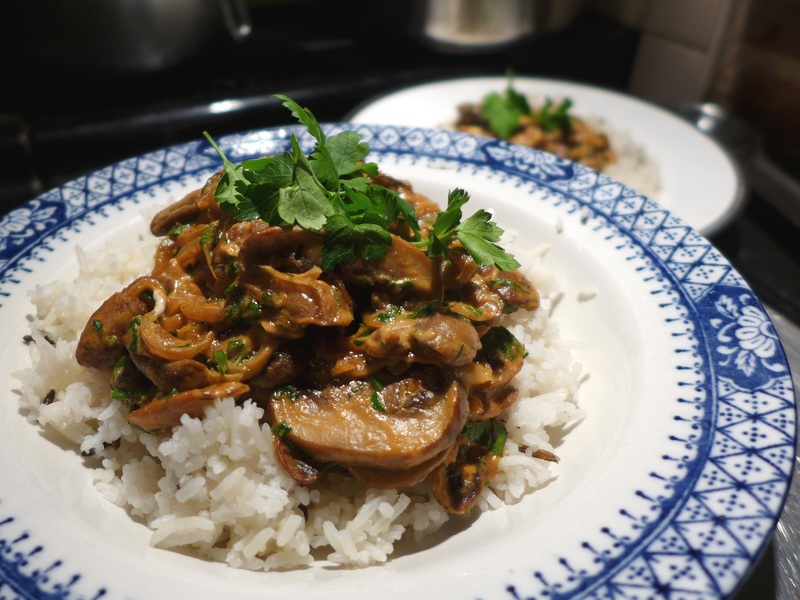 This entry was posted in Mains, Vegetables and salads, Vegetarian and tagged mushroom goulash, quick suppers by Linda Duffin. Bookmark the permalink. 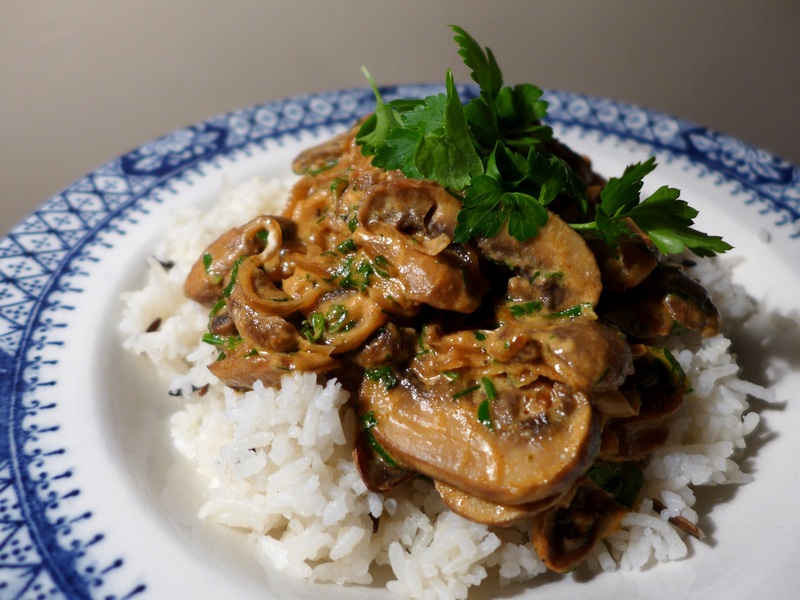 Mushroom goulash (or stroganoff,, as I like to replace the beef with mushrooms) is one of my favourite meatless meals. I am definitely going to try this one! Delicious! I make a very similar dish and we never tire of it. The depth of flavour is truly amazing for just vegetables. A couple of tablespoons of port helps too…. Oh I can taste that caraway! So often British cooks are a bit scared of lobbing it in but you clearly aren’t. More power to your elbow, am going to make this. Gosh, so hard to imagine mushrooms as a luxury now, yes. I do like a goulash, will try this with some good meaty mushrooms. This looks delicious, Linda! We make something similar at home over pasta. It’s true comfort food. Mushrooms are so “meaty” anyway it’s very satisfying. Yes, it got through, Linda. Thanks for your comment! Excellent looking stuff Mrs. I had planned to cook a goulash and then forgot all about it. I must write these things down.